Hi, my name is Cathy Turner. I am a two-time Olympic gold medalist in short track speed skating and I also love to hunt. This past season, I shot with my bow what so many are calling a “Monster Buck”. I had heard the term before, but always envisioned a deer more like the size of a giant moose. I didn’t realize what a prize I had just gotten. I didn’t begin hunting until I was at least 30 years old. My Mom had moved out to Hilton, NY, about 15 miles outside of the city of Rochester and it seemed like everyone there hunted! Well, since my then-husband, Tim, also hunted, I decided to take the hunting course and learn all about this “hunting stuff”. It was interesting. I learned how we actually help protect society from diseases and also help to reduce the number of deer struck car accidents. This past fall, while driving to work, I heard on the radio that there had already been 7 deer struck accidents that morning, and that was all before 6:30am! Tim and his family always hunted in the Southern Tier opening day. The year I got my hunting license, they decided to take me along. It was an awesome experience for me. I was up in a tree, in the middle of the snowy woods, by myself, in the dark and even though it was a little scary, I actually loved it! As the sun came up, I saw deer, I saw turkey, I saw lots of animals and I was instantly addicted to the outdoors. That same year, I shot an 11 point buck with my gun. I remember how nervous and excited I was all at the same time. The buck died almost instantly so even though my entire body shook continuously for some time after the shot, I was OK. We made deer jerky, ate the back straps and even had sausage made. I was instantly hooked. I love venison! Since then, I have gotten only doe. I have had my bow hunters’ license now for years, but only started bow hunting about 4 years ago and have loved it ever since. There is so much skill involved and for me, it’s such a rush when I can put it all together. I have gotten a doe bow hunting each year since I started, but little did I know that this year, was going to be very special. One day, while putting up my ladder stand in my back woods, I saw him. He came out of nowhere and ran right in front of me into the pines towards my front property. I was immediately in “awe”. I said to my friend, “Holy cow, did you just see what I think I just saw? !” He had seen it too. It was my first time ever laying eyes on a big buck up close. I never saw him again that whole season, but I never forgot him. I chose my favorite tree stand that beautiful late October morning in 2010. The temperature was in the mid-to-high 30’s. The tree that my stand is in sets along a large group of pine trees facing about 70 yards of an open, grassy field with more thick pines on the other side. Since it’s so open, I would never have enough time to “get ready,” so I always have to “be ready” in case a deer suddenly appears before me and runs out in the open. Hence, I always stand there completely still, bow in hand with my release engaged and ready for action. I began my usual visualization techniques, imagining myself taking shots at various distances I had mentally staked out in my head. About 40 minutes had passed and then I heard it….a deep grunt coming from the pines across from me about 60 yards away. I had just studied deer grunts on a website a friend had sent me a few days before, so I knew it sounded like a buck. A few minutes went by and then I heard it again, this time much louder. All of a sudden, a quick, loud rustling of some branches from the pines in front of me and out popped a buck, a big buck! Due to my lack of experience when it comes to bucks, I figured it was maybe a large 8 pointer. I was so excited just to see a buck, a rare occasion for me. As quickly as it appeared, it then disappeared back into the woods about 15 yards adjacent to where it had entered. I remember saying to myself, “Wow! That was cool!” and then I just relaxed a bit and continued waiting for a casual doe to show up. About a half hour later, I heard a quick rustling of branches real close to where the earlier buck had disappeared back into the woods. All of a sudden, a doe came blasting out followed by a buck chasing her and they were running right towards me! I immediately drew my bow and positioned myself towards where they were heading to go back into the woods to my left. I remember thinking to myself, “Gosh, they’re running fast. I’m never going to get a shot in.” They were now about 60-70 yards away. I could feel my heart pounding fast and hard. I knew I had to pull myself together quickly and focus. Instinctively, I began to use the same relaxation techniques I had learned while training for the Olympics. I closed my eyes and took a deep breath in and let it out slowly. For those few seconds, I was able to imagine myself shooting the deer with a perfect shot. When I opened my eyes, I felt much calmer and was prepared for the oncoming challenge. When the doe got to within 20 yards of me, it slowed down to a brisk walk. I felt a quick rush come over my body. So far, luck was on my side; but, there was one single branch of pine needles that I knew was going to block my view of each deer as it approached. After that, there would be only one single opportunity for a shot before they would disappear into the woods. I had visualized this exact shot so many times in my mind, that I had confidence. When I finally saw the first deer pass the branch and enter my narrow target, I confirmed it was the doe and ignored it. I then focused my sole energy on the buck I knew I was about to see. Two steps later, the doe disappeared into the woods. Then, out of the corner of my eye, I could see the buck approaching the line of the branch. He was still walking at a good pace. I knew I needed to take a risk and do something I had never done before. I made a little whistle noise with my mouth and sure enough the buck stopped! It worked, except….the buck stopped directly behind the one branch that was in the way. I didn’t have a shot. I completely froze. This wasn’t supposed to happen. I waited for him to start walking again. He proceeded to take a couple steps and all of sudden was completely in my target. Nervously, I half-whistled once again and sure enough he stopped right where I wanted him to, a perfect 15-yard side shot. I took a deep breath in, let a little out, held it and took the shot. When I finally got down from my stand, I walked over to where I had shot him. There, lying on the ground was a half of one of my arrows and it was really bloody! I couldn’t resist. Quietly, I crawled on my hands and knees just a little ways into the pines to check things out. There was blood. I knew. I decided to wait longer. I wanted my 2 girls, Britney and Bayli (9 and 11 yrs), to help me track it. They love helping me find a deer and would be upset if they weren’t a part of this. About an hour later, at least 2 ½ hours after I had made the shot, my daughter, Britney, Tim and I headed out to track the deer from where I had last seen the blood in the pines. My other daughter, Bayli, was at gymnastics and couldn’t make it. We were all excited, especially my daughter. She was at the head of the line, yelling every few seconds, “Found some!” I was in the back double-checking everything. It didn’t take long before Britney wailed, “I see it! I see it!” At that moment, I felt a huge shot of adrenaline come over me. I had gotten a buck with a bow! The deer had only gone about 70 yards through the pines and my daughter and Tim were first “on the scene.” As I approached, I excitedly asked, “Is it big? Is it big?” The strength, slowness and deepness in Tim’s response said it all, “Oooooh yeah.” Then I saw it and I couldn’t believe my eyes. I jumped up and down and hugging my daughter. It was bigger than any deer I had ever seen! Thoughts like, “Where did this deer come from? Was this really my deer?” were immediately running through my head. It was just so big! Tim was already counting points. ”13 points,” he concluded. It was a perfect heart/lung shot. We took pictures, dressed the deer (found the other half of my arrow), and then loaded it up and took it to my friend, Ben Adams, who owns Creekwood Archery in Clarkson, NY, where my daughters and I practice shooting our bows from time to time. I didn’t understand anything about scoring, but as Ben blurted out measurements, I could see everyone’s eyes getting bigger and bigger. I knew this deer was special. We got him on the scale and he weighed 199.5 lbs. We took more pictures and then Ben broke out the record books. 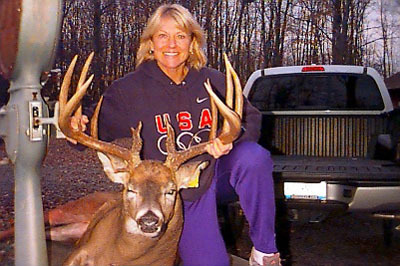 He said to me, “Girl, you have no idea do you?” He told me that my deer’s score at that moment was the 2nd largest deer ever taken with a bow in New York State and that it would probably be the “deer of the year”. “Wow, record books!” It felt like I had just won another Olympic gold medal! I was thrilled. After that, everyone was telling me I had to have the buck mounted, something I knew little about. As luck would have it, Bill Yox, world-renowned whitetail taxidermist, lives in the very next town over! Bill is known for being one of the best whitetail taxidermists in the country so this was the next stop for my big buck. He had it butchered for me and then safely hung on to the rack until it was time to have it officially scored. 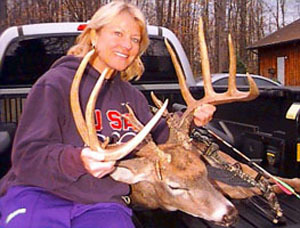 On January 5th, 2011, the buck scored 181 6/8th gross and 170 1/8th net. It was enough to make it into all of the “big books.” How cool! Hunting has changed my life in so many ways. I love the solitude of being out in the woods by myself, watching the sunrise and experiencing all that nature has to offer. It makes me happy. I love the challenge of hunting for my own food and feeling like a warrior in my own way. In today’s crazy, busy world of technology, the great outdoors are a true blessing to me and my family. We camp, we fish and now I’m fortunate to have an opportunity to pass on this exciting, fun and challenging sport of hunting to my own daughters. I don’t know if I’ll ever get another “Monster Buck” again, but one thing I do know for sure…I will always be able to hear the excitement in my daughter’s voice when she first saw the buck, “I see it! I see it!” and for that, I’m truly grateful.